A review of Jamie Quinn Mystery Collection Books 1-3. Post may contain affiliate links. 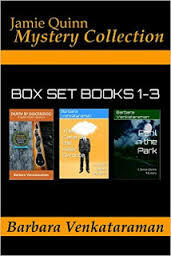 This is a collection of three books: Death by Didgeridoo, The Case of the Killer Divorce, and Peril in the Park. They are very short books, I think the total of all three books comes in at a little over 300 pages. So, they are a quick and easy read. The main character is Jamie Quinn. She is a lawyer, not a criminal lawyer, but seems to find herself in a lot of situations that require her to act more like a criminal lawyer. Luckily she has her friend, Duke, a womanizing private eye to help her. There is an easy banter with plenty of witty comebacks between her and her friend. The stories all build upon each other. With Jamie giving a bit of history in each successive story. The story lines are varied enough to keep each one interesting. The first story involves the death of a music instructor and Jamie’s autistic cousin is the number one suspect. In the next story, one of her client’s husband is found dead, and Jamie’s client is a suspect. In the last story, Jamie meets up with a long lost high school beau who seems to be accidentally involved in some shady park service activities. The stories are quick and easy to read. They remind me of a television series. Quirky characters, witty banter, a few twists and turns, and a quick wrap up. I really enjoyed Jamie Quinn Mystery Collection Books 1-3 by Barbara Venkataraman. I received a copy of these books in exchange for an honest review. Lawyers are often centered in mysteries, I’ve noticed. Quick and entertaining is my go-to these days; these sound like a good set of books.